Secure your valuable bike with the right bike lock. A lot of bike accessories focus on security. There is however no more important accessory for our road bikes or mountain bikes than a solid lock. It is not just the bike itself, but also other valuable items such as bags or helmets that can be kept secures with the right bike lock. There are plenty of things to look out for when purchasing the right bike lock. Aside from the various different locking systems and security levels, there are also different types of locks you can purchase. When deciding between a U-lock, a spiral lock, rope lock, chain lock and folding lock, there are a few things you should know. The following points explain. What should you watch out for when purchasing a bike lock? First of all, you should consider how important the security level of a lock is. Do you just need a compact lock to take with you or deter thieves from taking your old town bike? Or would you like a professional, near impossible to crack bike lock for your brand new MTB or expensive road bike? Or just a simple solution for preventing theft of your bags and accessories? These questions are all relevant to finding the right type of bike lock for your needs. Rope locks and spiral locks are generally lightweight, cheaper and more compact options that can be simply attached to the frame of your bike or stored in your backpack. They deter thieves and provide the security needed when touring for your bike or for accessories like your bag and helmet. These bike locks are made of a flexible wire rope that is surrounded by plastic, giving it a wide range of options when tying it up without leaving any scratch marks on your bike frame. 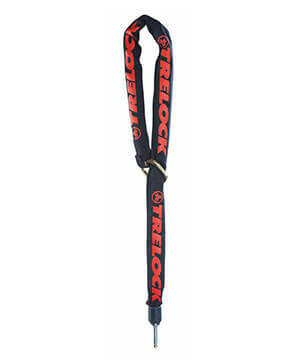 Chain locks are similarly flexible and also have an outer casing. 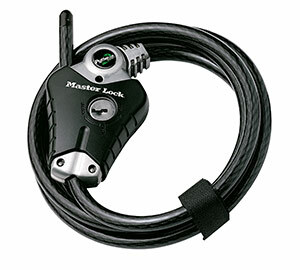 This type of bike lock is however noticeably heavier and robuster than rope models. They have no bracket and can be wrapped around the seat post like rope locks. If you don't want to compromise on safety, then you should definitely choose a robust folding or D-lock. These are heavier and larger locks that are very sturdy are secures to the frame triangle via a bracket. These only offer a limited radius to attach your bike to a post and are mostly not padded on the outside. That is why it is important to choose wisely where you leave your bike locked up and not to bang the bike lock against the valuable frame. You can find locks here that offer the highest security for your bike. Other things to look out for when buying a lock are corrosion protection and lock type. Plastic doesn't rust, but breaks easily. Keys can be lost, codes need to be remembered. In the end it all comes down to personal preference.